Google Now launcher is one of the most widely used Android launchers. Now when Google has decided to discontinue the Google Now launcher, I have brought few alternatives to Google Now launchers. In this article, I am listing 5 best Google Now launcher alternatives you can try and think of using after Google Now. 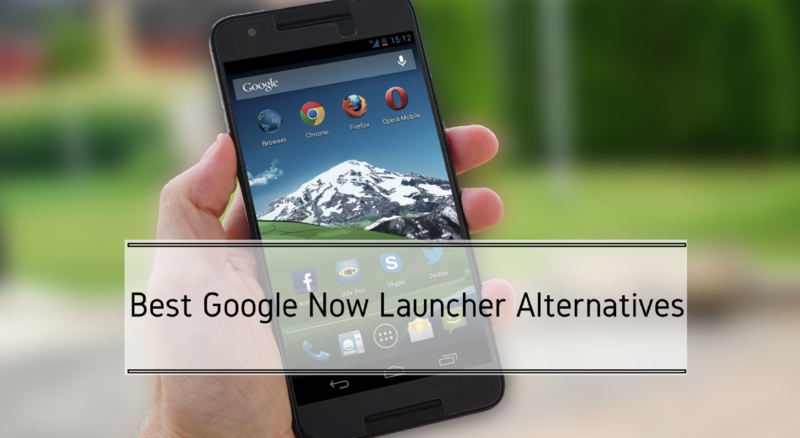 Here are few Android Launchers that can work good after you have no option to use Google Now. Try any of these or all to see what suits you. Nova Launcher is one of the most popular and powerful Android launcher packed with lots of features. It lets you tweak the phone’s home screen and customize most of the things. For those who do not want to do things manually, Nova Launcher offers detail settings. Nova launcher organizes all the apps vertically in the app drawer. You can set custom gestures if you want to use. Nova launcher comes for free to download and use, but you can also buy Nova Prime for better and more powerful features. Action Launcher 3 is another popular Android launcher that you can see as a good alternative to Google Now launcher. It comes with simple and easy to use interface. It takes some time to understand your experience and then start showing contextual menus. You can customize most of the things. You can swipe up from your dock to reveal the new full screen all apps modes and use the new circular folder style. You can also use custom icons to give your phone a better look. There is also a plus version of the launcher to give you additional features and options. Pixel Launcher is the same that was used in the Google Pixel and Pixel XL devices. It comes with new design and somewhere I found it better than Google Now launcher. The Pixel launcher looks good and does most of the jobs you would like your phone’s launcher to do. It performs smoothly. You have App suggestions, swipe left to go to Google App and few gestures and more. This launcher works best if you are running the latest version of Android and few features are not supported by most of the phones. This is the reason I am listing it at the third place. Nougat Launcher is also a strong alternative to Google Now Launcher. It has many similarities including the app drawer style, swipe down in app drawer to search and more. The launcher is packed with many customization options and allows you to adjust the colour of the app drawer, the size of icons, and even change the theme. You can also enable many gestures to perform most of the tasks quickly. Arrow Launcher is developed by Microsoft and offers nice experience on Android phones. This launcher offers the clean design and smoother interface. It also borrowed few features from iOS including the spotlight-search like feature. The app drawer is also there to manage your apps. You also get various other nice options to customize the look and feel. Google Play store has so many Android phone launchers. So, you have plenty of options to customize your phone and get amazing experience. If you do not like any of these 5 listed in the phone, you can try exploring the play store for more options. Do not forget to share your favourite Android launcher with us. You can put that in the comment section below. How to tell if someone on Twitter has blocked You?